Best way to travel you ask? Best way to travel you ask? The oldest means of locomotion, also the most organic & natural way, is limbs down the most superior method. That is assuming that you are not just looking to go from point A to point B, but also interested in watching & imbibing everything in between. To me personally walking is more than that. It is a form of non-still meditation. In a steady state it can even soothe frayed nerves & calm tormented psyches. But the benefits extend to other spheres too. I can’t think of a better way to build up an appetite than a slightly strenuous yet not punishing amble. Doing the same in a contrived room-size fishtank is not what I am talking about. Post meal, it is also easily the most pleasing way to help the ingested stuff to jell slowly in the innards. How many miles is too many? After I started my journey, walking even 3-5 miles for a meal didn’t seem like an effort. As for a real sight, walking 25 miles isn’t too much to ask. That is what I did to visit the Punakha (Bird’s Nest) Monastery in Bhutan. I was almost prevented from entering the monastery proper since I didn’t have a full-arm covering shirt, though a guard reluctantly gave me his coat to allow me to complete the journey. The walk, grueling yet beautiful and pleasant, had been so rewarding in itself, that I was very willing to do an about turn without being disappointed – that nonchalance was what shocked one of the guards into lending me his jacket so I could ‘complete’ my trip! A few days later after I had walked some 8 miles, I arrived at a monastery only to find its charred remains. I had been forewarned, but I had just not imagined the total destruction that I witnessed. Even with such an horrendous ending, the walk had consoled with the pristine setting all along the trail & back. Glamorous company, and a delicious pizza washed down with coffee, brought the focus back on the journey & away from one particular unfortunate destination. Walking makes you part of the landscape without a metal or glass to isolate you from the beauty, and allowing to use all your senses to enjoy the package as a whole. The opportunities for interaction with life along the way is boundless. I have often found my initial destination set at the outset compromised by something more beautiful, whether an impromptu chat or meal or a fork off the mainline. On occasion, passers-by have offered me rides when they heard how long I was going to walk – even insisting that it would be ‘free’ on the mistaken assumption that I was walking due to penury! On the road a few years ago, I read an encyclopediac work on walking titled ‘Wanderlust: A history of walking’. Good read, but in the case of this reader, the author was preaching to the converted. I never had any doubts about the beneficial effects of long walks – on mind, body and soul. If I had to repeat my round-the-world trip, I would love to do it again, on foot! Walking remains the best way to familiarize yourself with a city’s maze, and the familiarity that follows doesn’t lead to contempt but a sense of closeness that makes the coyest place slowly reveal itself to you. When you stride confidently thus, you are an alien no more even in a foreign land. Barring a very short-lived affair with fitness equipment, walking has been my only source of exercise. But apparently it is quite effective in extinguishing most traces of the ungodly amounts of chocolate, chips, ice-cream, rice, pizza and wine I devour. The particular trail featured in the picture is in Sorata, a beautiful mountain village in Bolivia. But my most memorable walk thus far surely is the 35-mile circumambulation (‘parikrama’) at an average altitude of 15000 ft, around Kailash mountain in Tibet – pure wholesome bliss. A few months ago a friend suggested that I watch the movie ‘The Way’. Then, coincidentally, two more people suggested it in quick succession, ultimately pushing me to do it. The story is set around one man’s pilgrimage on the ‘Camino de Santiago’. Lovely setting, bringing on a smile every time I identified with a situation or a character, and that happened quite a few times over its length. Nevertheless, a walk so crowded – another ‘Coca Cola route’? – can’t possibly be the *real thing*! I recall reading of a similar centuries-old route in Japan, and I think a few gorgeous miles I trudged near Asuka/Kashihara were part of that path. Books like Bryson’s ‘Walk in the Woods’, Rachel Joyce’s ‘The Unlikely Pilgrimage of Harold Fry’, Stewart’s ‘The Places in Between’, Ma Jian’s ‘Red Dust’ can all provide some inspiration and an ounce of vicarious pleasure. But the real pleasure is walking the walk. Buen Camino! Guru has been on the road for around 7 years now. 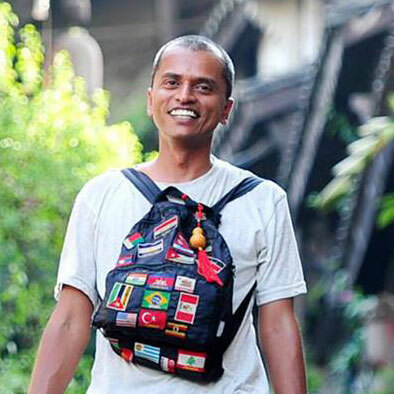 He has been slow-traveling the world on an Indian passport. Based in Silicon Valley for a few years, he quit the startup world to follow his childhood dream of seeing the world. He hopes everyone gets a chance to spend at least a year on the road. It is truly life-changing he says. You can follow him at facebook.com/therealguru, and also at couchsurfing.com/theguru.